Hardwood floors are naturally beautiful, with the wood exuding a feeling of resilience, strength, and longevity. However, even with proper care and maintenance, over time, what was once a beautiful floor may now appear worn, stained, beat-up and even noisy. At this stage, homeowners are faced with either refinishing the floor or replacing the floor. Determining which method to choose is based on an assessment of the condition of the floor and a thorough understanding of the advantages and disadvantages of each method. A professional can help you assess the condition of your floor. They will look for the root cause of floor damage, such as moisture, foundation settling and other factors. If moisture has taken its toll on your hardwood floors, keep in mind that the problem will simply reoccur over time unless the moisture source is resolved. Kitchens, bathrooms and basements, however, can all benefit from installing engineered hardwood flooring, which has a highly stable core that is less likely to expand, contract or shift when exposed to moisture, thus making it a great option in areas subject to moisture.1 If structural issues are present, such as foundation settling causing gaps in the hardwood floor boards, these foundational issues need to be addressed before a new floor is installed. So, too would the issue of degraded wood due to factors such as termite damage. Another good reason to replace a floor is aesthetics. 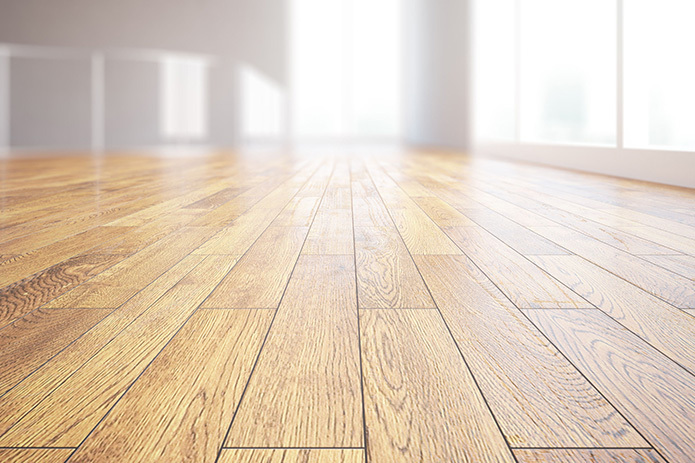 Most older hardwood floors were made of solid oak or pine. Pine, a soft wood, has a tendency to sag and get bouncy over time. Pine floors may need to be replaced. Also, if you don’t like the wood species, or the width or direction of the planks in the floor, you will need to replace the floor. Replacement is a good option if you want a completely new look for your flooring. If you don’t like the color of the floor, however, a professional can stain the floor based on a color you choose. Another big factor to consider when debating refinishing or replacing is inconvenience. With either method, all furniture and other items must be removed from the room, generally by the homeowner. All openings to the room to be refinished must be sealed to contain any debris generated by the sanding process. If the floor color is to be changed, or if pet or other stains need to be eliminated, the floor will need to be stained. This requires several applications, with sanding done between each application. A final finish will be applied to the floor. This will take 24 hours to up to a week to dry because of the wait times between finish coats. Installing a new hardwood floor is generally done much faster, especially if the new flooring is prefinished hardwood. If making the decision to refinish or replace seems overwhelming, seek the advice of a qualified flooring professional. That professional can help you assess your floor and determine the exact costs associated with refinishing and replacing, so you can make an educated decision based on your own unique situation. With over 80 years experience in the hardwood flooring industry, Cameron the Sandman can help. We are happy to answer any of your hardwood flooring questions or concerns. Our residential and commercial services include hardwood sales, installation, refinishing, restoration and more! Call us today for a consultation and to learn more!